Madrasi is your city guide to Chennai India. Whether you shop for a luxurious Powered Self lifting Chair or ordinary cheap plastic chair - you have wider choice now. Find tricks to make your Chennai home furniture shopping experience absolutely rewarding. Get to know popular home furniture shops in Chennai. To many, Chennai is synonymous with heat. Yet, Chennaites know the art of living life to the fullest oblivious of the unceasing hot, humid, sultry and perennially sweaty weather. How is this possible? It is through smart acclimatization. Yes, Chennaites know that some things in Chennai will never change and that includes the heat and humidity level. Opting for soft cotton clothes, cooling off with tender coconut and karumbu juice, savoring malgova mangoes unmindful of the heat in mid-summer, packing off with family to the Marina and enjoy the cool sea breeze are all part of acclimatizing to Chennai weather. What about indoors? Today, buying furniture is rather related to the size of the house rather than personal preference. At the same time, the furniture should compliment lifestyle, home décor as well as make small space functional. Hence, the code words ought to be cool, functional, stylish, maintenance free, smaller in scale yet reasonable and affordable. Here is a guide to buying furniture for chennai homes. Read through to understand what you must keep in mind when buying imported furniture or locally made furniture. Also, here is a list of shops in Chennai where you can find most of your furniture needs - from wardrobes to cots, entertainment centers to computer tables. Master the art of buying comfortable home furniture on a budget without compromising on quality. Furniture is often construed as mirroring one's personality. Get started by drawing a rough floor plan of the rooms and how you would like to arrange furniture. Then consider the following. Measure doorways, stairways, sharp corners and lofts. Aim for wise utilization of available space. Prioritize which furniture is required first. Choose furniture outlet: Branded furniture shops, department store, discount shops, used furniture stores antique furniture etc. Wood furniture with its natural ability can enhance any home-set up. Every type of wood furniture reflects its natural characteristic easily identifiable with that particular tree. Mango and Acacia are generally used for wooden furniture construction. Sheesham (Rosewood), Mahogany, Teak and Pine are comparatively costlier. A combination with less expensive wood is also possible. Wood furniture is shock-resistant and durable. The durability factor is directly related to the quality of wood used. Wood furniture is almost maintenance free, except for routine dusting. There are many shops in Chennai that sell modern branded furniture at fancy prices. If you prefer to patronize local craftsmanship, locally made wooden furniture required for comfortable living are also available. Also, if you have always cherished a desire to bring home the vibrancy and richness of Chettinad style furniture; you may have to head to furniture godowns in Chettinad. There are select outlets in Chennai, like Meena Muthiah's Chettinad Art Gallery and Sivakami Subbiah's Kipling and Co Arts that specialize in Chettinad furniture and crafts. Today, there is an array of foldable wooden furniture that contribute to space saving. And, the most important aspect of wood furniture relevant to Chennaites is wood furniture does not absorb heat and it always remains cool to the touch. Check the wood surface, the tone, dark or light, the dents or other blemishes before choosing wood furniture. If you are a lover of hand-made furniture, cane furniture would be the best choice. Cane furniture is a symbol of natural beauty. Strong yet lightweight, long life, elegant look, classy patterns, great appeal and comfort, these are the characteristic features of cane furniture. Cane furniture is a perfect selection for indoors. Water on cane furniture will change the colour to black and even bends the wood. 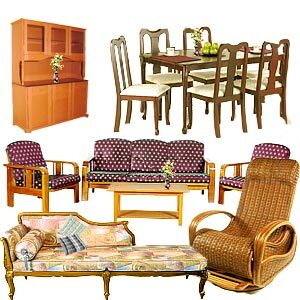 Chennai has a plethora of cane furniture selling shops that sell all kinds of furniture you need in your home. Most of these shops sell chairs, tables, dressing tables, breakfast tables or dining sets, stools, shoe racks, bookshelves, TV stands, room partition, cane easy chair, cane moodah, cabinets, beds, couches and even recliners. While shopping, check the thickness of the cane, which reaffirms its durability. Cane furniture would be the ideal choice for cool Chennai homes for they would neither retain nor radiate heat as compared to steel and plastic furniture. Cane furniture requires very little care. Periodically, use cane furniture care tips provided by the seller to pamper cane furniture, so that you enjoy it for years to come. Cane furniture however, may not be a best buy for people with butter-fingers. Compared to wooden furniture, cane furniture is not sturdy. Even a small break can mar the beauty of the furniture. Metal furniture has an inherent quality to lighten up the whole environment. Select shops in Chennai display tempting varieties of metal furniture. Metal furniture is either made using aluminum or steel (iron). Steel furniture is comparatively costlier than aluminum furniture. Home furniture constructed from durable iron is comfortable, durable and decorative. The cost is directly related to the thickness of the metal, be it aluminum or iron. Heavier metal furniture guarantees long life. Aluminum furniture is more in demand as it is rust-resistant. Check the weight, sturdiness of the furniture and the method used for joining the metals. Finally, check what type of finish has been applied to the metal furniture to determine its durability. Choose from a great variety of design sofa sets, side and center tables, kitchen racks, dining tables, bunker beds, study chairs, easy chairs, telephone racks, computer tables, entertainment racks and wall-mounted racks for curio display. Jayabharatham Furniture and Appliances Ltd, Nitraa Furniture Damro Furniture, Sathya Furniture World, Style Spa Furniture Ltd are leading furniture shops in Chennai with multiple branch locations. Every locality in Chennai has a number of home furniture shops making it easier for customers to commute and shop. Take a look at Chennai home furniture directory in the Internet to locate the nearest furniture shop. You can also visit Budget Furniture, Durafurn Inc, Furniture zone, Saagar Furniture, Sonali Chairs and Interiors, Woodpecker furniture etc. Evaluate and allocate money for furniture purchase. Make a list of furniture items. Segregate list into primary items and secondary items. Look for a reliable carpenter and ask for an invoice. Compare price list with ready-made furniture. Look for home furniture deals, home furniture at discount rates. Consider visiting wholesale furniture shops. Compare rates. Consider options like if existing furniture can be remodeled/modified. Would you like to buy all new furniture or try a mix of used and new furniture? Go through used furniture advertisements well as visit used home furniture shops.